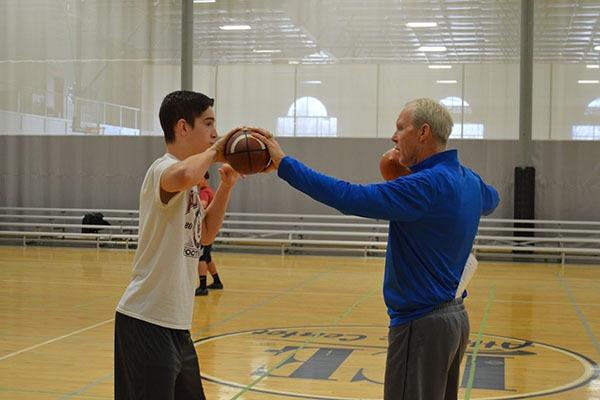 Bill Reagan’s Top Gun Quarterback Camps and Training Sessions develop the very core of a quarterback’s necessary skills. Just as a top golfer needs a “swing” coach or a professional tennis player continues to fine tune his/her game with a personal coach, so too quarterbacks today need to be sound in the habits they form while also constantly needing to fine tune their skills. Far too many quarterbacks get too far into their playing years with poor footwork. At Top Gun an emphasis is placed on the proper training for three, five and play action pass drops. Once a quarterback has worked his drop, he must attempt to maintain a base within the chaos of the pocket. This is a priority with Bill who includes drills to maintain proper body position and balance, enhancing the potential for making the best throw possible. Throwing a football is a combination of art and science but bad habits can begin long before quarterback training ever does. Coach Reagan has developed a systematic approach to develop and/or refine the basic mechanics for throwing a football. An efficiently thrown ball is not only a “thing of beauty” but also has a much greater probability of hitting the target and arriving there on time. NFL scouts continue to emphasize accuracy over arm strength for quarterbacks. Beyond training to perfect the throwing motion, Bill includes unique drills to improve accuracy. 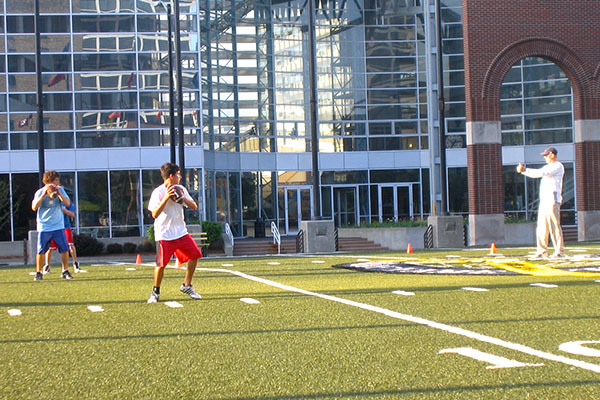 Quarterbacks may struggle to develop arm strength but accuracy is very attainable. Quarterbacks will vary in the amount of athleticism they possess but all will need to practice passing on the run and throws from awkward positions. You can’t prepare for every awkward situation but in training for throwing on the run and other difficult passing circumstances, quarterbacks will learn their limitations and be much more prepared for throwing on the move. It is one thing to be a great passer but it is another to make the right decision of who to throw to. Reagan incorporates drills that force quarterbacks to make quick decisions and eliminate primary targets, if covered. These also tie-in to footwork as the feet connect to where the eyes focus. This most elementary of quarterback skills is often overlooked in quarterback development but can be critical in eliminating turnovers. Top Gun training integrates not only basic ball handling but various play action fakes. There is an important difference between practice drills and performance drills. At Top Gun the bulk of time is spent on practice drills and the perfection of quarterback techniques. Quarterbacks need to be challenged though and as training progresses, more and more performance drills are introduced for quarterbacks to see how they perform under pressure. You get more than just a great technique coach when you train with Bill Reagan. As a former coaching staff member of both Division I and Division II Universities and having gone through the recruiting process with two sons, one at the FCS level and one at Division III, Coach Reagan is a great resource and mentor for those striving to reach the next level and have expectations of going through the recruiting process. If you’re ready to take your game to the next level, register for a training camp today! "Bill and I share many of the same beliefs and quarterback training techniques. He is a great teacher, he's just been at it longer"
"I have personally observed Bill Reagan's expertise and attention to detail when coaching quarterbacks. If you have the opportunity to work with Bill, you should take it. He is part of a special group of instructors who have committed to making young quarterbacks the finest they can be." "Bill Reagan is a true professional. There is no one I would rather have work with one of my sons, should they decide to be a quarterback. I have witnessed first-hand Bill's expertise and teaching style. In a word he is excellent." "Bill Reagan represents some of the highest quality private quarterback coaching there is today. He is very sound in basic fundamentals as well as being thorough and creative with his training techniques." "Coach Reagan knows quarterback mechanics and fundamentals like few others. His passion for the position is what makes him such a quality instructor. He is also a great mentor for quarterbacks beyond the football field. If you get the opportunity to work with him, don't pass it up." "Learning the basic position fundamentals should be at the top of the list for every young athlete. When it comes to teaching Quarterback fundamentals and techniques, Coach Bill Reagan is as good as there is." "I had the opportunity to work with Bill Reagan for a Notre Dame Alumni football game in Tokyo. He helped me polish up things like footwork and throwing motion, in order to play in the game. He is the best. Thanks Bill for making this old guy feel like he still has it."